The most recent issue of Science Magazine, published by the American Association for the Advancement of Science, contains a letter from Chilean scientists decrying the lack of funding and support for research in the country. The scientists, Pablo Astudillo, Carlos J. Blondel, Tomas Nrambuena and Katia Soto, writing on behalf of the organization Más Ciencia para Chile said Chile badly needed to update its science policies. They noted that Brazil and Argentina had Ministries of Science and that Peru was working on a new Ministry of Science, Technology and Innovation. “For years, Chile’s politicians and economists have talked about the need to increase scientific research to become a developed nation. However, indicators of governmental performance and research policy in Chile, especially when compared with other Organization for Economic Co-operation and Development (OECD) countries—an organization that Chile has only recently joined—indicate poor performance in terms of investment, researchers, and even public promotion and attitudes to research,” the letter said. Some of the multiple identities Pinochet used to open accounts at U.S. banks, uncovered by a U.S. Senate investigation into money laundering. It was something of an anticlimax, the opening of General Augusto Pinochet’s last will and testament. Officials from Chile’s state defence council were hoping it might shed light on the size of the late dictator’s fortune and where he might have stashed it. In 2005 a U.S. Senate money laundering investigation discovered that Pinochet, his family and associates had an extensive network of over 125 bank accounts and securities in the Riggs Bank and other U.S. financial institutions to move millions of dollars (http://www.levin.senate.gov/imo/media/doc/supporting/2005/pinochetreport.pdf). The U.S. Senate report prompted the Chilean Supreme Court to conduct its own investigation, which revealed that Pinochet had at least $21 million at the time of his death in 2006, but only $3 million could be explained by his earnings as head of state and army commander. Pinochet is known to have drawn up his will in 2000, following his release from detention in Britain. A newer version of the will was drawn up in 2005, and this is what was opened in a Santiago court, in the presence of a notary and two witnesses, both friends of the Pinochet family. But the document’s contents only changed the executor, from Oscar Aitken—whom the U.S. Senate report describes as Pinochet’s financial advisor and conduit for questionable payments—to one Julia Hormazabal. There was nothing about beneficiaries or legacies. So now authorities are seeking the original will, drawn up in 2000 following his return to Santiago after his detention in London. Stay tuned. 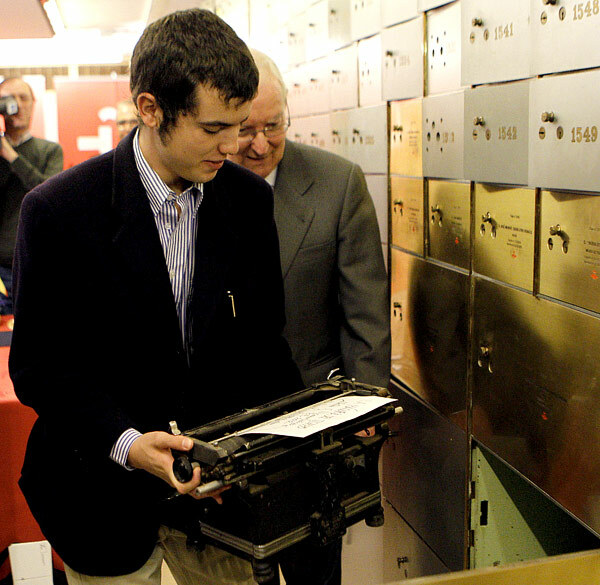 Cristobal Ugarte, grandson of Nicanor Parra, deposits the Chilean poet's old typewriter into a vault at Spain's Cervantes Institute. Climb aboard if you want. bleeding from the mouth and nose. His official web site, www.nicanorparra.cl, contains only the poem above in the original Spanish, set alongside a childlike drawing with the words, “You’re asking me?? Anti-poetry is you!” He was too fragile to make the trip to Spain but sent his grandson to collect the prize and to hand over the ancient typewriter he has used to write his poetry. That typewriter has just been deposited in a vault in Spain’s Cervantes Institute, which this week awarded Nicanor Parra the Spanish language’s highest literary honor. The typewriter holds an unpublished poem which may not be read until 50 years from now. Parra is the third Chilean to win this award, following essayist Jorge Edwards (1999) and poet Gonzalo Rojo (2003). And Chile has two Nobel Prize-winning poets, Gabriela Mistral (who became the first Latin American winner in 1945) and Pablo Neruda (1971). Canadian Prime Minister Stephen Harper was in Santiago on an official visit when the quake struck, but he and his delegation were unaffected. The quake’s epicentre was 26 miles northeast of Valparaiso, prompting the National Emergency Service ONEMI to order the evacuation of communities along a 400-mile stretch of coastline. According to ONEMI director Benjamin Chacana, some 13,000 people had been evacuated. 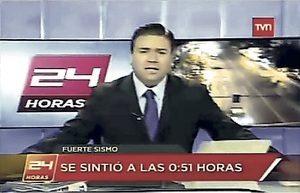 It was the second strong quake to hit central Chile since March 25, when a 7.1-magnitude earthquake struck. And two years ago the country suffered an 8.8-magnitude earthquake and a tsunami that destroyed much of the southern coastal city of Constitucion. National Public Radio has a review of the Chilean film “Post Mortem,” http://www.npr.org/2012/04/12/150283739/post-mortem-dissecting-chiles-social-trauma, whose protagonist works at a Santiago morgue at the time of the 1973 military coup.